With the Brother PED-Basic® Software and card reader/writer you can download embroidery designs from the Internet and write them from your PC onto original Brother cards. 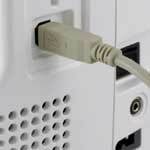 Your Brother embroidery machine such as the SE350, LB6770 PRW, or PE700 doesn’t have a USB port. Or you want to organize your designs on memory cards. If your embroidery machine has a USB port that is compatible with a USB stick or thumb drive such as the PE770, you can just store designs on a thumb drive and don’t need to write memory cards. If your embroidery machine has a USB port that attaches to your computer, such as the SE400, HE240, LB6800 PRW, you can download embroidery patterns from your computer and save them in the machine’s memory. If you want to create or digitize your own design, you will need to buy more advanced software that might include a card writer. Even if your embroidery machine has a USB port that attaches to your computer for downloading, you might still want to write embroidery designs on a memory card. For example, if you don’t have a laptop or it’s inconvenient to move your computer next to the embroidery machine, you can transfer designs on a memory card. Of course use your own judgement. You might have a good reason for needing this software that I don’t know about. Print template grid that you can use as a template to place the design on your embroidery project. Realistic stitch design preview – The stitching and colors are displayed on your computer screen so that you can preview the actual embroidery. Writes the embroidery design data (.pes files) to Brother original memory cards for your embroidery machine. 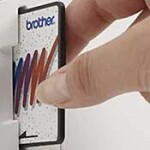 For use with all Brother home embroidery machines with a memory card slot. Note: This product cannot be used to create embroidery data or designs. Compatible with Windows compatible computers with a USB port and CD-ROM drive. Requires Windows 98 operating system or later. Be sure to check for compatibility with your own computer. Click here, to download an updated driver from Brother’s Support website. Then click on “PED-Basic Update.” Then select your version of Windows from the options, click “Search” and download the driver. You can also download manuals from the Support Center. Note: Not compatible with Macintosh. 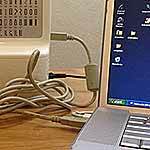 You must use additional software that runs Windows on a Macintosh such as Parallels Desktop, VMWare Fusion, or BootCamp to use PED-Basic with a Macintosh. 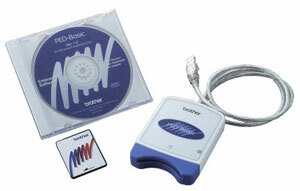 What’s Included with the Brother PED-Basic Software? 1. Using your computer and the PED-Basic software, download free or purchased PES embroidery data from any embroidery design site or pre-packaged design pack. 2. Preview and/or edit the imported embroidery data on the screen. 3. Write the PES data file to an original Brother embroidery card. 4. Insert the card into the slot on your embroidery machine, press the Memory Card Key on the control panel, and select the design you want to embroider. Continue the same as with a built-in design. Many people ask me how to write more than one design or how to add additional designs to a card without overwriting the old designs. It’s easy to do, but the manual isn’t very clear. So here’s how. Click the browse button and navigate to the folder where your embroidery designs are. This can be a folder on your hard drive or on a CD. Then in the box on the left — the “Available Patterns List” — you’ll see the designs you can copy. Click the pattern you want to write to the card. Then Click the arrow button in the center of the boxes to move the design to the “Selected patterns list.” Do this for all the designs you want to write to the card. Be sure to keep checking the “Card capacity indicator” because the card may not hold all the designs you want, especially if you have a lot of them from a CD. You can also select multiple designs by, holding down the Ctrl key or Shift key while clicking the designs. Or you can just drag the designs from the left box to the right box. All the designs in the right box will get written to the card. Brother PED-Basic Reviews — What Are Others Saying? I have the brother se 625 my computor windows is apparently to old to upload designs to a flashdrive which inserts into the se 625 is there a problem with this machine ,I don’t see anyone asking about them ? Hello, I am considering buying a laptop for use with my cricut and to use with my brother as 400. Does it matter what kind of laptop I get? I just discovered your web page on the brother se400 machine. I was planning on selling my machine because I wasn’t using it. I decided I would look further on the internet to see if there are tutorials that would help me use this machine more.